Herzog & de Meuron are of course the Swiss architects credited with the building, and Ai Weiwei the Chinese artist of considerable regard who served as the design consultant on the project, and is largely credited with creating the “birds nest” design which has made the aesthetics of the Beijing National Stadium so famous. For a long time, I’ve believed that the credit for the design goes one step back from even Ai Weiwei. So with the spirit of the Olympics in high gear, the world as one and so on, I think credit needs to be given to the ones I would argue are responsible for the origins of the design – Chinese migrant workers. They are the ones who are literally building the new Beijing, so I feel credit is due when they have a hand in actually designing an icon of the city. I’ve spent a considerable amount of time in Beijing over the past few years working with and exploring contemporary creativity in China, and, as is the case with much of my work, I’ve found that the most interesting aspects of what is going on are happening outside the formal channels. 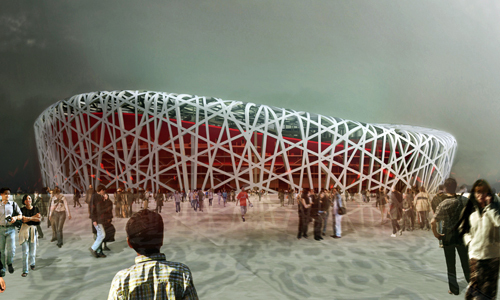 The design of the “birds nest” stadium being a prime example. Driving around Beijing, the first thing you notice is of course the yellow air the staggering amount of building works taking place. New builds are everywhere, mostly built on top of razed Hutongs, but for the buildings being gutted and renovated, a deeper story begins taking place for me. 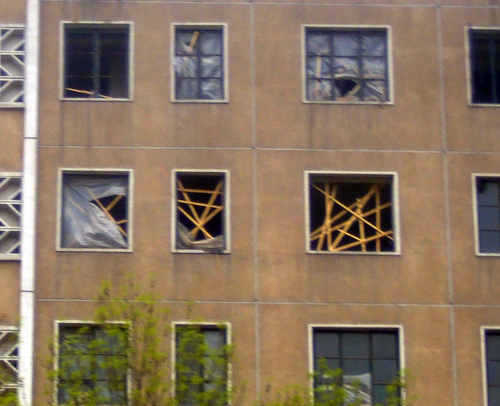 What I began to notice in almost every building is that, in the absence of formal safety equipment and structures, workers created intricate dense weaves in the upper story windows of the buildings they were working in to primarily, well, keep from falling out while they were working. These wooden weaves were always constructed with the same type of slats, and their assembly in a seemingly random fashion, yet after seeing dozens of them you begin to find a pattern in the repetition of assembly and structure. 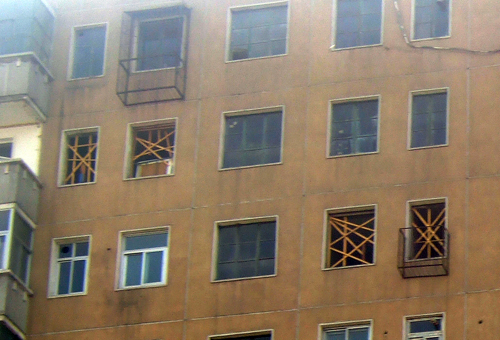 Of particular note is that a secondary function of these wooden structures is to discourage birds from flying in and nesting in disused buildings. The stadium’s design nickname of the “birds nest” takes on an even more interesting hue now. Beyond the inspiration derived from the protective structures built by the workers in the buildings, there is credit due to the functional creativity of the migrant workers elsewhere. During an early exploration around the building site of Rem Koolhaas’s CCTV building when work was first getting underway, I noticed that the tools the workers were using were almost entirely self-made. Pieces of iron from the building’s raw materials would be welded together to create a crow-bar, or bolts would be welded side-to-side at their head to create a hexagonal wrench for tightening the same bolt in its original state. Thus, the building materials themselves were being re-purposed to create custom tools to continue building. A self-generating building site was taking shape. I often find that these moments of incidental aesthetic and functional creativity often trumps the formal by leaps and bounds, yet go largely uncelebrated when the contributions enter mainstream focus. The CCTV building owes a great deal to the creativity of its workers, and the Olympic Stadium to its original designers. So – a tip of the hat to the unsung inspiration for its design, IMHO. you’re commenting on aesthetics, just one part of a successful piece of architecture. One of the main design ideas that H&M have always touted, but what gets left on the media’s collective cutting room floor, is the openness of the ground floor and how it plays into ideas of open processes, continuum between interior and exterior and unfettered democratic space. I do appreciate the origins of the sculptural aesthetics, but design encompasses much more than the look of a thing. It’s unfortunate that so many buildings get evaluated based solely on their graphic and sculptural qualities rather than on their architectural design. Slater – I certainly understand and agree that the aesthetics are only one part of a successful piece of architecture and only one element of the overall grand design of the building. But as you said, all the attention has been on the visual exterior aesthetic, and for that reason I felt it necessary to dig deeper into that aesthetic, as I felt it hadn’t been explored as fully as deserved. But yes – it’s only one slice of a much larger and impressive pie. Thanks for your comment. Architects and artists are forever inspired by culture. It goes hand and hand. At the same time, it is a great challenge to formalize something very abstract- in this case a structure for safety and bird prevention. I appreciate you observation and study of the origin of what inspired the bird’s nest, but I don’t agree with crediting the Chinese migrant workers for it. Please, correct me if I am wrong, but I believe it was the people who dubbed the stadium Birds Nest and not the artist or architects. 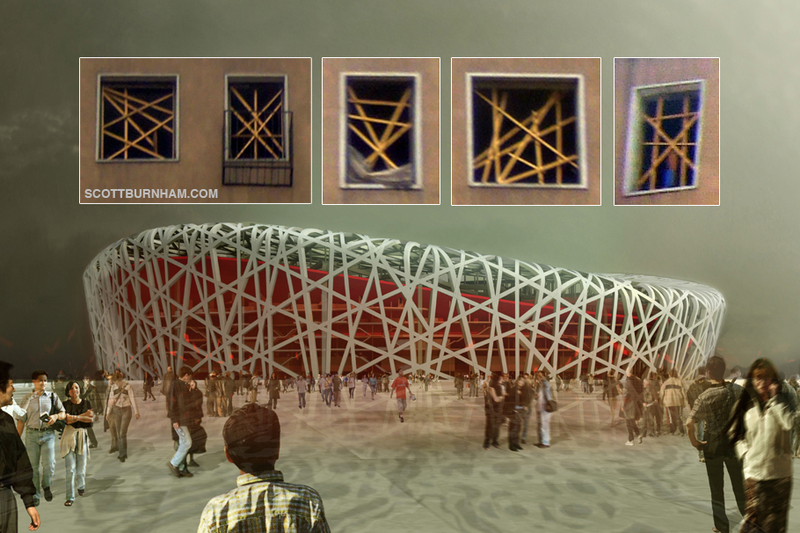 I thing that the architects did great work if they took the element for the nest from the Bejing streets. How clever is that and how respectful for Bejing and people, who are building “New Bejing”. Don’t forget, that it’s always creative job of designer, artist, architect etc. to be inspired by simple things and make them special, really visible and the subject to remember.